Emerging from the Brazilian karting scene in 1993 da Matta quickly made his mark and became the Brazilian Formula Ford Champion and in 1994 moved up to the naational Formula 3 series and won that as well. This prompted a move to Europe and in 1995 he contested the British F3 series but failed to make a major impact and in 1996 he switched to the Formula 3000 championship although again he did not enjoy as much success as he had hoped. This led to a switch to Indy Lights in 1997 and he won the title the following year and moved in CART in 1999. Having learned the business in 1999 he joined PPI Motorsport in 2000 and scored his first victory in Chicago. 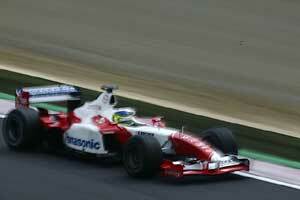 He moved to Newman Haas in 2001 and finished fifth in the series and in 2002 won the CART title in dominant fashion. Support from Toyota enabled him to switch to Formula 1 in 2003 but he failed to make a breakthrough and in the middle of 2004 was dropped by the team. Da Matta went back to Champ Cars in America in 2005 with PKV Racing and won a race in Portland but finished only 11th in the championship. In 2006 he switched to Dale Coyne Racing but was then picked up in the midseason when AJ Allmendinger left RuSport and Da Matta took over. In August 2006, however, he collided with a deer during a test at Road America and suffered serious head injuries which left him in a coma for several days.